EUGENIA LEIGH is the author of Blood, Sparrows and Sparrows (Four Way Books, 2014), which was a finalist for both the National Poetry Series and the Yale Series of Younger Poets. 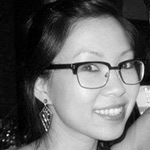 A Korean American poet and Kundiman fellow, she serves as Poetry Editor for Kartika Review. Eugenia holds an MFA in poetry from Sarah Lawrence College and lives in New York City.